In 2008, the then president of Guyana, Bharrat Jagdeo, established within the Ministry of the Presidency the Office of Climate Change. Guyana became the first country in the region to do so. A year later, Jagdeo set out a vision to forge a new low carbon economy in the Caribbean nation. 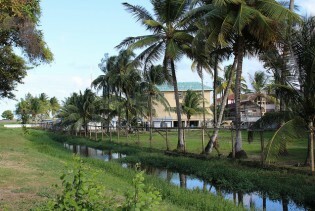 For several decades, Guyana has been using mangroves to protect its coasts against natural hazards, and the country believes its mangrove forests should be included in programmes like the REDD+ of United Nations, in order to access financing to continue their restoration and maintenance, as they complement miles of seawalls that help to prevent flooding. Recent huge offshore oil discoveries are believed to have set Guyana– one of the poorest countries in South America–on a path to riches. But they have also highlighted the country’s development challenges and the potential impact of an oil boom. Guyana is forging ahead with plans to exploit vast offshore reserves of oil and gas, even while speaking eloquently of its leadership in transitioning to a green economy at a recent political party congress addressed by the country's president. At the head of Guyana’s Essequibo River, 50 miles inland from the Atlantic Ocean, you will find the town of Bartica. Considered the gateway to Guyana’s interior, the town has a population of about 15,000 and is the launching point for people who work in the forests mining gold and diamonds. The recent discovery of large volumes of oil offshore of Guyana could prove to be a major headache for the country, as the Caribbean Community (CARICOM) and other Alliance of Small Island States (AOSIS) members press for keeping global temperature rise to 1.5 degrees C above pre-industrial levels as provided for in the historic Paris Climate Agreement. Climate change is already affecting the Caribbean. But there is concern that a gap still exists between what the region’s leaders are saying about the issue and what residents believe. Despite its highly variable climate, Guyana is the only Caribbean Community (CARICOM) country that enjoys food security. But rapid climate change could pose a challenge not only for Guyana, but for its Caribbean neigbours who depend on the South American country for much of their produce. Ruth Osman is attractive and well-groomed in tailored slacks and a patterned blouse, topped by a soft jacket worn open. Her demeanour and polished accent belie the stereotypical view that most Caribbean nationals have of Guyanese migrants. Most Caribbean countries are famous for their sun, sand and warm sea breezes. Far fewer are known for their wide use of solar, wind and other forms of renewable energy. Guyana is shaping up to set a gold standard for the Caribbean in implementing a national energy efficiency strategy to curb greenhouse gas emissions from fossil fuels. It’s a dirty, smelly business, but wastewater is gaining prominence across the Caribbean as countries from Jamaica in the west to Guyana in the south increasingly recognise its effects on the environment and the importance of improving its management. Guyana is engaged in a balancing act to save its rainforest, regarded as a living treasure, from the destructive activities of miners digging their way to another kind of treasure buried beneath this fragile ecosystem. Climbing up the coconut industry has been anything but easy for Rosamund Benn, who has dedicated the past 32 years of her life working on a 50-acre coconut farm in The Pomeroon, a farming region of Guyana. The Caribbean has the unenviable reputation as one of the most disaster-prone regions in the world, a situation exacerbated by climate change and vulnerability that experts warn could have significant economic consequences if unaddressed. As regional delegates meet to discuss a legally binding ban on the use of mercury this week, Guyanese officials are arguing that an exception should be made for the South American country's lucrative gold mining sector until an acceptable alternative is found.